NBC Bay Area and Telemundo 48’s first Supporting Our Schools initiative will help thousands of local students receive backpacks filled with pencils, books and more. Chris Chmura reports. All too often, children don’t have the school supplies — pens, paper, notebooks and more — that they need to succeed in school. Teachers struggle to fill the gap without the resources they need. So this July, NBC Bay Area, Telemundo Area de la Bahia, and other NBC- and Telemundo-owned television stations across the country began an initiative called Supporting Our Schools. We partnered with several nonprofits, including Family Giving Tree, Communities in Schools, DonorsChoose.org, United Way, and Boys & Girls Club, in an effort to help those in need with school supplies for the upcoming academic year. Volunteers on Saturday helped to fill backpacks at the Family Giving Tree warehouse in Sunnyvale. "I think this is a pretty big production," said Emily Chang. People began to file into the warehouse around sunrise. A generous spirit trumped sleep on Saturday and the event was soon packed. "I’m here because I’m trying to help others in need," said Cee Cee Camper. As children get ready for the new academic year, there is a mounting need for school supplies. NBC Bay Area and Telemundo 48 are in the final push in supporting our schools. 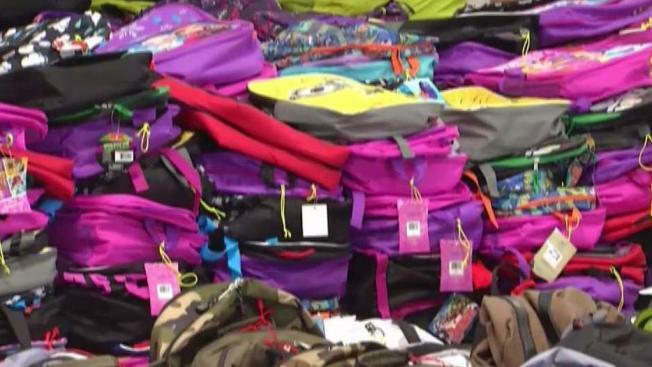 The charities involved have a lofty goal: to collect 40,000 backpacks, according to Larry Loper of the Family Giving Tree. But as impressive as that number might sound, it represents only a fraction of the need. "It’s probably about 10 percent of the need in the Bay Area," Loper said. Nonetheless, the volunteers were confident that their contribution of stuffing pencils, paper and more into backpacks will make a difference when children return to school. "We want to help them and we want to show that we care for them," Camper said. Students on the assembly line seemed especially aware that the next person to touch these backpacks might be their very own classmates. "I think they’re going to be really happy because they can’t afford this," Chang said. "(There) are a lot of school supplies, and they’re going to think someone else loves them." Through Saturday, people were also able to drop off donations at select Boys & Girls Clubs in the Bay Area or make donations online at FamilyGivingTree.org.